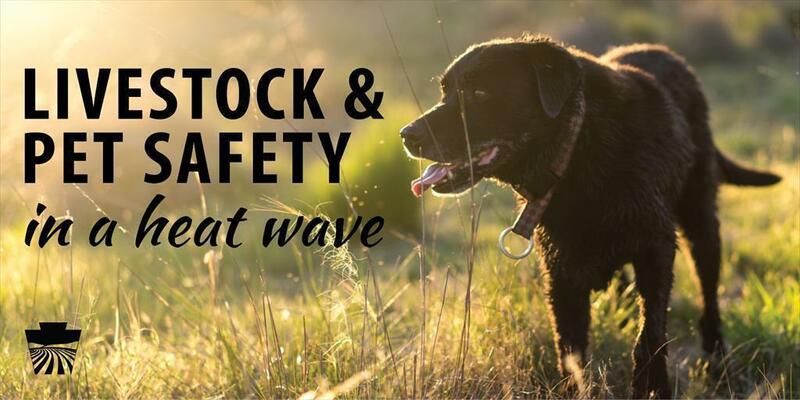 Livestock and pet owners should take appropriate precautions to protect their animals from high temperatures that can cause them to suffer from heat-related stress and illness. Heavier, fattened livestock, those with dark coats, and chronic health conditions are at the greatest risk for stress from heat. Pet owners should remember to not leave animals in vehicles. A car's interior temperature can rise within minutes, creating suffocating temperatures that lead to animal health problems and often death. When pets are outdoors, it's important to be sure they have access to shade and plenty of fresh, clean, cool water. Animals kept indoors should have proper ventilation. For more information or if you have concerns about the health of your pets or livestock, contact your local veterinarian. Animal cruelty reminder: if you suspect animal abuse or neglect and would like to report it, you should contact your local humane society police officer or local police station. In the absence of local police, contact the Pennsylvania State Police. Pennsylvania dog wardens do not have jurisdiction over animal cruelty.